Quilt National, a biennial art quilt exhibition in Ohio, is widely regarded as the premier event in the contemporary quilting calendar. In 2013 "there were 851 quilts submitted by 458 artists from 44 states, 17 countries and five Canadian Provinces. 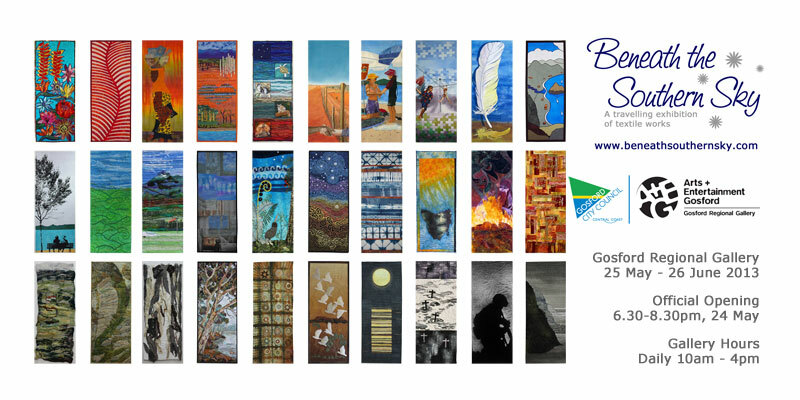 Jurors Linda Colsh, Penny McMorris, and Judith Content selected 85 quilts by 85 artists. The exhibitors represented 27 states and 7 foreign countries. 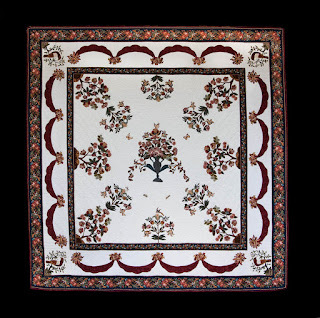 In this exhibition 20 percent of the exhibitors are first time Quilt National artists." 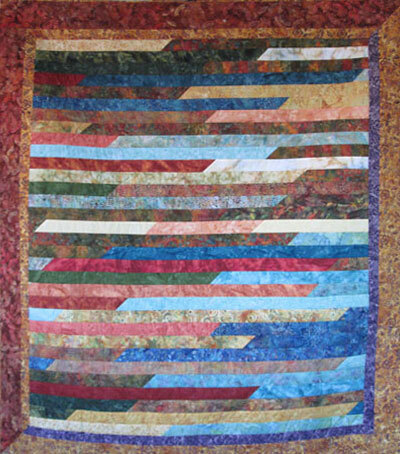 Congratulations to Guild member Dianne Firth who was awarded the McCarthy Memorial Award for her quilt Storm. You can view Dianne's work, and the quilts of the other prize winners, in the Quilt National 2013 Prize Winners Gallery. The work of many Guild members is featured in the travelling exhibition Beneath the Southern Sky which opened at Gosford Regional Gallery last week. The exhibition continues until Wednesday, 26 June and Brenda Gael Smith will be presenting a curator's floor talk at 1pm on Saturday, 1 June and again at 1pm on Saturday, 22 June. The gallery is open daily from 10am-4pm. This is the final opportunity to see the exhibition in Australia. Catch it while you can! There are a record number of entries for this year's Quilt Show, ensuring that "Drop-Off Persons" will have a busy time collating and checking their cohort's quilts. Is the sleeve on the back secure, with a minimum finished depth of at least 8cm? Are all pins and needles removed? Is the identifying label securely sewn on the back? These particular Quilt Show volunteers are no doubt finishing off their own entries, so please make their very responsible involvement less challenging by having one more look at your entry. All members of The Quilters' Guild of NSW Inc are invited to attend The Exhibition Dinner. Download Exhibition Dinner Booking Form. A booking form was also included in the May issue of The Template, however if there is a wish not to use that page and a photocopier is unavailable then consider phoning the Guild Office today. The volunteers there can complete a form with credit card details over the phone for you. As publicised, the Guest Speaker at the Dinner will be the extremely talented and internationally regarded Australian Textile Artist, Sue Dennis. Her particular topic during this evening of fun and companionship will be "Quilting Adventures from Mt Isa to Mongolia"
Anyone who has followed her blog in recent times will know that her talk is bound to be colourful and informative. It is indeed a privilege to have Sue share her quilting journey with us at the Dinner. If you are out and about this weekend in the countryside, then be charmed by two forthcoming quilt shows being presented by rural textile groups. Guild members are invited to join the jelly roll race (aka 1600 Race) at the Sydney Quilt Show on Thursday through Sunday, 13-16 June. A team may consist of one up to three people. If we get a lot of interest we will try and fill teams of three. If you are interested in participating but can’t form a team, please submit your name and we will try and link you up with other enthusiastic quilters. 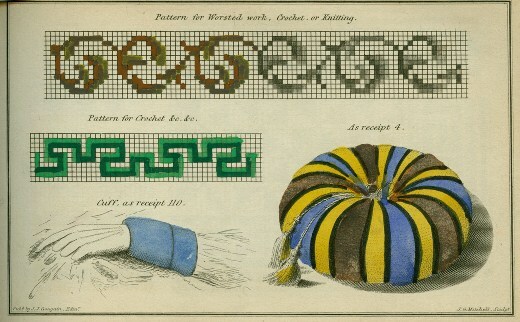 Each Team is to pick a Name and Colour Code for clothing.- Be Decorative and Creative. Each Team Member to receive a free entry if required. It is hoped that you would be able to volunteer as white glove for another session of the day if possible or continue to demonstrate sewing techniques at the machines. You may spend time preparing before the race getting to know the machine and filling bobbins. I think you should have your strip prepared, ie sewn together, to start the race and then the race should take approx 45 minutes. Happy to have a race from scratch if this is what the teams prefer. The fabric used can be either a bought jelly roll or indeed 40 x 21/2 inch strips from your stash. You pay for the fabric yourselves but take the finished top home hopefully at the end of the show so that we can have them on display for the entire show. Does anyone have a finished jelly roll race quilt we can display? This event is meant to be a bit of fun for both participants and spectators and not to be taken too seriously (except for safety requirements). Any Questions or to submit a team please email Deborah Laurie, with the details below or submit the Jelly Roll Race Application Form at the Guild Office before Friday 31 May. Tour of the Caroline Simpson Library and Research Collection. The Quilt Study Group of NSW has arranged for two tours of the Historic Houses Trust’s Caroline Simpson Library and Research Collection. It is located in the Mint Building on Macquarie Street and is open to the public from Tuesday to Friday. It contains many items of interest touching on the history of houses, garden design and interior furnishing in New South Wales. The librarian will show us paintings, prints, textiles, wallpapers and other large format collection items, and you can stay on to continue your research into your quilts by using their excellent specialist research facilities. See http://www.hht.net.au/collections/library for further details. Numbers for each tour are strictly limited to 15 people but there are currently some places left on both dates. Please contact the Quilters' Guild of NSW Office (ph: 9283 3737) to secure your place on either of the tours. For those members who look forward to the annual Guild Retreat, please be advised that this year's creative weekend will be in September. Redleaf Resort is the extremely quiet accommodation at Blackheath in The Blue Mountains that has been booked for the "get-away"
There is a licensed bar, restaurant, conference facilities and many cosy fireplaces to ensure that the weekend is comfortable. The Guild's website has further information for those who are thinking about committing to a weekend of fun, food and maybe,"finishes". It is always a casual gathering, and this location offers a chance to enjoy wonderful views, walks, wildlife, and interesting local cafe and craft shops with other quilters. cnr Evans Lookout and Valley View Road, Blackheath. The Annual Exhibition Dinner is set for Friday, 14th June 2013 at the Rockford Novotel Darling Harbour with guest speaker Sue Dennis. Bookings for the Dinner close on Friday, 24th May 2013. Download and return the Exhibition Dinner Booking Form. Join the Guild general meeting at Burwood RSL this Saturday, 18 May for a special afternoon tea to celebrate Australia's Biggest Quilting Bee & Morning Tea with a gold coin donation for the Cancer Council. PS: If you would like to bake a slice/cake it would be muchly appreciated - thank you! The next General Meeting of the Quilters' Guild of NSW Inc. will be held on Saturday 18 May 2013. 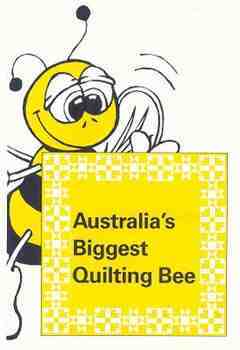 As this will be the last meeting prior to Sydney Quilt Show, please bring your completed Volunteer Forms if possible. It will be of help to the Hostesses if a personal mug is used, to partake in afternoon tea. The 91st Annual St Ives Show, presented by the Northern Suburbs Agricultural and Horticultural Society Inc, is set to entertain Sydney families on Saturday 18th and Sunday 19th May at St Ives Showground, Mona Vale Road, St Ives. Within the "Craft" Exhibition catagory, there will be quilts to be viewed. Both Amateur and Professional quilters are vying for prizes in "Traditional", "Hand quilted", and "Machine quilted" categories. There is free parking at the grounds and free shuttle buses will run from Gordon Station. Come and enjoy the Sydney Quilt Show from behind the scenes! 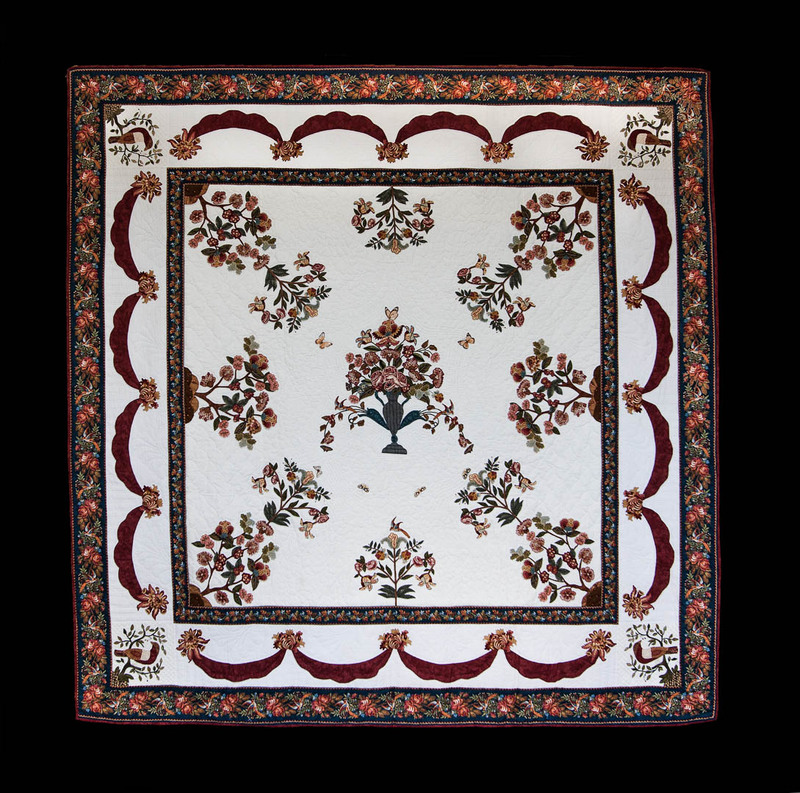 The excitement is now mounting for all of those members who are exhibiting a quilt at this year's show. As always, to help make this event a success, the Guild needs your help. If you have not returned your 'Volunteer Form' with a Show Entry, then please think about filling it in now, with shift preferences for any of the five days, plus Set-up Day, of the Show. By signing up, you can make this a less stressful time for the hard working Exhibition Committee, so please consider lending a hand for an hour or two, or more. Various responsibilities include 'White Glove' duty, as well as selling Raffle tickets and catalogues. Everyone makes a new friend! and by volunteering, you can become more connected to the Guild, the members and activities. All volunteers will receive a Volunteer 2013 Quilt Show Badge as well as a catalogue. Please contact the Guild Office should extra forms be needed. Volunteer Forms must be returned by the 24th May.